Pigott Stinson | What’s your agenda? 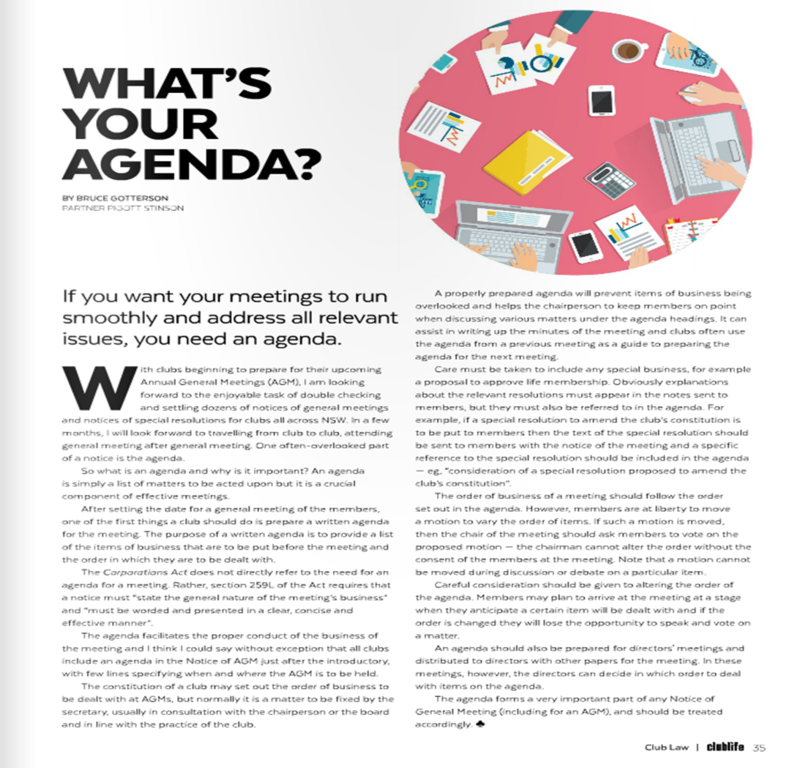 If you want your meetings to run smoothly and address all relevant issues, you need an agenda. This article appeared in the June 2016 issue of Club Life. With clubs beginning to prepare for their upcoming Annual General Meetings (AGM), I am looking forward to the enjoyable task of double checking and settling dozens of notices of general meetings and notices of special resolutions for clubs all across NSW. In a few months, I will look forward to traveling from club to club, attending general meeting after general meeting. One often-overlooked part of a notice is the agenda. So what is an agenda and why is it important? 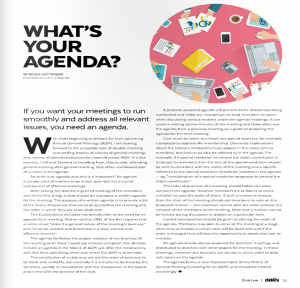 An agenda is simply a list of matters to be acted upon but it is a crucial component of effective meetings. After setting the date for a general meeting of the members, one of the first things a club should do is prepare a written agenda for the meeting. The purpose of a written agenda is to provide a list of the items of business that are to be put before the meeting and the order in which they are to be dealt with. The Corporations Act does not directly refer to the need for an agenda for a meeting. Rather, section 259L of the Act requires that a notice must “state the general nature of the meeting’s business” and “must be worded and presented in a clear, concise and effective manner”. The agenda facilitates the proper conduct of the business of the meeting and I think I could say without exception that all clubs include an agenda in the Notice of AGM just after the introductory few lines specifying when and where the AGM is to be held. The constitution of a club may set out the order of business to be dealt with at AGMs, but normally it is a matter to be fixed by the secretary, usually in consultation with the chairperson or the board and in line with the practice of the club. A properly prepared agenda will prevent items of business being overlooked and helps the chairperson to keep members on point when discussing various matters under the agenda headings. It can assist in writing up the minutes of the meeting and clubs often use the agenda from a previous meeting as a guide to preparing the agenda for the next meeting. Care must be taken to include any special business, for example a proposal to approve life membership. Obviously explanations about the relevant resolutions must appear in the notes sent to members, but they must also be referred to in the agenda. For example, if a special resolution to amend the club’s constitution is to be put to members then the text of the special resolution should be sent to members with the notice of the meeting and a specific reference to the special resolution should be included in the agenda – eg, “consideration of a special resolution proposed to amend the club’s constitution”. The order of business of a meeting should follow the order set out in the agenda. However, members are at liberty to move a motion to vary the order of items. If such a motion is moved, then the chair of the meeting should ask members to vote on the proposed motion – the chairman cannot alter the order without the consent of the members at the meeting. Note that a motion cannot be moved during discussion or debate on a particular item. Careful consideration should be given to altering the order of the agenda. Members may plan to arrive at the meeting at a stage when they anticipate a certain item will be dealt with and if the order is changed they will lose the opportunity to speak and vote on a matter. An agenda should also be prepared for directors’ meetings and distributed to directors with other papers for the meeting. In these meetings, however, the directors can decide in which order to deal with items on the agenda. The agenda forms a very important part of any Notice of General Meeting (including for an AGM), and should be treated accordingly. Click on the image below to see the article as it appeared in Club Life June 2016.